Tottenham continued their great run with their sixth successive league win at the expense of 10-man Bolton. 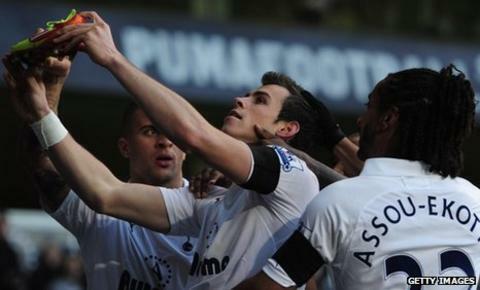 Gareth Bale gave Spurs an early lead with flick from Luka Modric's corner before paying tribute to Gary Speed in his celebrations. Bolton were then down to 10 men when defender Gary Cahill was sent off for a foul on midfielder Scott Parker. Aaron Lennon added an overdue second with a strike from 15 yards before Jermain Defoe swept in the third. It finished 3-0 but Spurs could easily have won 10-0, such was their dominance. Harry Redknapp's side were magnificent in attack although their cause was helped by the harsh red card received by Bolton centre-back Cahill early in the game. The decision by referee Stuart Attwell bordered on the ridiculous. Cahill brought down Parker with a late challenge about 10 yards from the halfway line and wide on the left, but instead of a deserved yellow the defender was directed to the touchline. Predictably, Attwell, who sent off Cahill at Arsenal last season, was given a earful by Bolton boss Owen Coyle as the players came off for the break. The red card made the task for the struggling Trotters all the more difficult, having gone behind to Bale's strike inside the first 10 minutes. The Wales winger was first to Modric's low corner from the right and his improvised flick beat Jussi Jaaskelainen at the near post. In his celebrations, Bale paid tribute to his national team manager Speed, who died last Sunday, by taking off his left boot, with 'RIP Gary Speed' stiched on it, and raising it in front of the Bolton fans - a team his fellow Welshman once played for. The reason Spurs only managed to score three was largely because of the brilliance of Jaaskelainen. The Finn saved from Bale, Adebayor and Defoe in the first half and made two more exceptional stops from Parker and Bale after the break. But he could only keep the door shut for so long and soon after the break Spurs improved their goals to chances ratio when Lennon cut in inside the area to smash in the second. And on the hour mark, Defoe all but sealed the win when he met Bale's flick from another Modric corner. Tottenham brought on attacking maestro Rafael van der Vaart in the second half, which, if anything, highlighted that unlike in previous seasons, Redknapp's side have a squad strong enough to challenge for the title. It is now 10 wins and a draw in 11 games and if this proves to be the Spurs manager's last season in charge, with many tipping him for England, then do not be surprised if he signs off in style.